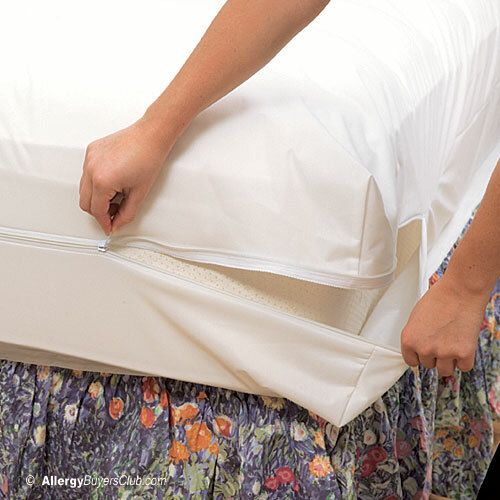 Dust Mite Allergen and Bed Bug proof mattress covers by White Mountain Textiles. Soft and comfortable stretch knit polyester fabric with barrier membrane. Impenetrable to dust mites and allergens. Tested and certified bed bug escape and bite proof. Waterproof. See expert Reviews and Advice. Fits mattresses up to 16-inches in depth. Our White Mountain Textiles Stretch Knit Dust Mite & Bed Bug Mattress Covers offer excellent protection at an affordable price. Made of polyester stretch knit, these mattress covers are soft and comfortable to sleep on with no crinkling under your sheets. These mattress covers feature a urethane barrier lining that is breathable yet offers impenetrable protection against dust mites, allergens and bed bugs, as well as offers waterproof protection against spills and stains. 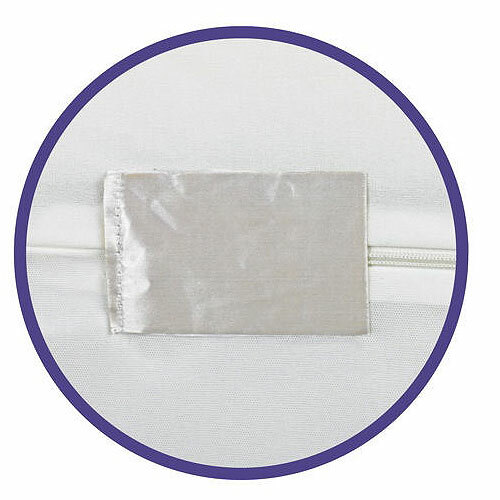 Their unique, patented BugStop® seal ensure a secure zipper closure preventing bed bugs from getting in or out. Polyester zipper closure. Color: White. 1-year warranty. See all of our White Mountain Textile Dust Mite Covers. 3 depth choices: 9", 12" or 16"
Easy to put on and off thanks to the extra give of the stretch knit fabric. Soft surface feel is a nice touch for a polyester membrane lined fabric. Both the urethane membrane and poly-stretch knit fabric is quiet and does not make the annoying crinkly sound found with many synthetic or membrane lined fabrics . The dual function of these covers being 100% waterproof makes them a great choice for bed wetter's or those who are worried about spills or stains on a new mattress. 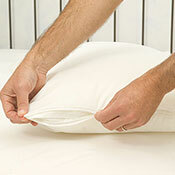 The fabric is cool to the touch and membrane is breathable which helps ensure a comfortable night's sleep. Impenetrable barrier to dust mites and allergens. Bed bug escape and bite proof. Patent pending BugStop® seal ensures a secure shut. Machine washable and able to withstand frequent washing without reducing their barrier efficiency which is the case with cotton and other woven barrier covers. Made from synthetic materials. These covers would not be suitable for someone who needs or wants a chemical free product due to MCS or other sensitivities to chemicals or synthetics. Not as breathable as 100% cotton. These covers may not be the best choice for those who sleep hot. If you want the protection of a vinyl or membrane mattress cover but also want it to feel nice under your sheets, then our stretch knit dust mite & bed bug covers are your best choice. They have a thin urethane membrane on the underside of the cover to block 100% of dust mites and their allergens, stop bed bug bites and provide waterproof protection. 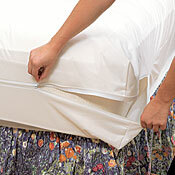 They also offer an easy to use secure zipper seal to keep bed bugs from entering or escaping. What separates these covers apart from other membrane covers is the polyester stretch knit fabric that feels like jersey cotton. This offers a nice surface to sleep on that is quiet without the feel of plastic under your sheets. The stretch fabric also makes it slightly easier to put on your mattress and reduces the fear of ripping as you pull and tug them into place. (If you have never put a cover on your mattress before, I should warn you it is not a single person job, especially with large, heavy mattresses). These covers are durable, protected by a lifetime warranty and will withstand multiple washings without reducing their efficiency to block dust mites and allergens. These are our top pick for an affordable dust mite or bed bug mattress cover that offers sleeping comfort and excellent protection year after year. They would also be an ideal choice for young children or incontinence thanks to their waterproof protection and washability without reduced efficiency. Includes 2 pillow covers. Impenetrable allergen barrier and Bed Bug proof. Sizes: Standard, Queen, or King. Twin 39"W x 75"L 9",12", 16"
Twin XL 39"W x 80"L 9",12", 16"
Full 54"W x 75"L 9",12", 16"
Queen 60"W x 80"L 9",12", 16"
King 78"W x 80"L 9",12", 16"
Cal King 72"W x 84"L 9",12", 16"